› Outlook › Email › Don’t Send Attachments to CC’d Recipients? 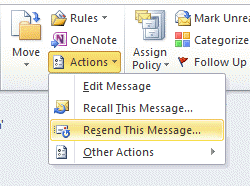 There are a lot of former Notes users who don't like how Outlook handles attachments. In Notes, it's really easy to send an attachment to people in the To line but not to those in the CC or BCC lines. While its usually better that send a link to the attachment on the file share or SharePoint site, reality in the user world is that attachments are faster and easier, and it is useful to send attachments to some, but not all, recipients. Outlook can't send attachments to some recipients. Users need to either send the attachment to everyone or send the message twice - once to the recipients who get the attachment and then to those who don't get the attachment. They can either open the message and use the Resend option or forward it. When you use a SMTP mail server and send your e-mail to the server, you can only send one copy of the message. Your e-mail client compiles a list of recipients from its To, CC, and BCC fields. For each of those recipients, it sends a RCPT-TO command to the mail server. The is followed with a single DATA command that sends the content of your e-mail (headers, blank delimiter line, and body) to the mail server. So the mail server sees the RCPT-TO commands to specify the recipients and a DATA command to know what it is supposed to send to each recipient. Your mail server doesn't care which recipient was in which *field* inside the UI for your e-mail client. If you want different content to be sent in the one DATA command per e-mail send then you need to send a different message. Send one copy of your e-mail with attachments to one set of recipients. Send another copy of your e-mail without attachments to a different set of recipients. The easiest way to send the second version is from the Sent folder. Go into Edit mode (Actions, Resend this message). Delete the addresses in the To and CC fields. Enter the address who should not receive the attachment.